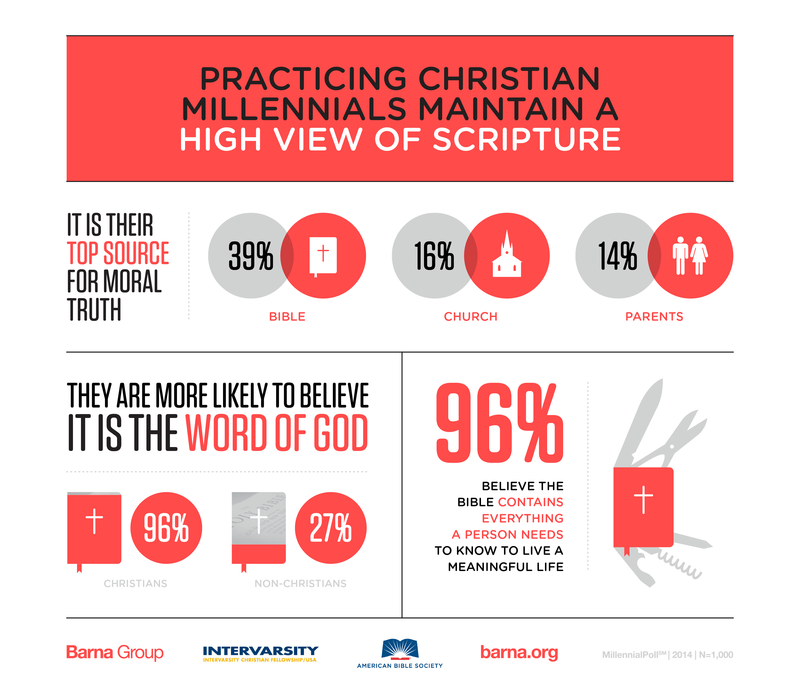 On the whole, Bible reading among Christian Millennials is considered to be one of their highest priorities – ranking it more important than church attendance. It is also ranked as their greatest source for moral truth and they believe it holds everything they need to know in order to live a meaningful life. Categories: Interaction | Tags: #bgbg2, Bible reading, millennials, Screen Age | Permalink. The daily practice of Bible reading and reflection is essential for our spiritual health and growth. Yet most people don’t read the Bible regularly (e.g. only 4% of Canadians read the Bible on a daily basis). One of the reasons why so few people read and reflect on God’s Word may be because we lack discipline. To say we lack discipline is to suggest we’re deficient in the assertion of our willpower over our more base desires. Rather than doing what we know is best, we prefer to take the easy street, chase the fast buck, seek the quick fix, or enjoy the things that give us instant gratification. At the root of the problem – we’re basically lazy. We simply don’t want to do the hard work required to align our motivations with reasoned aims. My mother used to say, “Sometimes the things we don’t like are good for us”. Last year my doctor wanted me to take medication for high cholesterol. It would have been easy to pop a pill. But I refused, knowing that if I went on a strict diet, exercised more and lost weight, I could bring my cholesterol level down. So I’m on a low sodium, low cholesterol, low trans fat diet (probably for the rest of my life). I dislike the diet because I don’t get to eat some of the foods I really enjoy. But the diet is good for me – according to the latest blood test my cholesterol levels are now satisfactory. The dictionary defines a disciplined person as someone who’s established a goal and is willing to achieve that goal at the expense of his or her individuality. I love cheese. Just the mention of brie, aged cheddar, gruyere or pepper jack, gets me salivating. But cheese is high in cholesterol and if I want to be healthy (the goal) I must hold back when the cheese board is on the table. Yes I know, all you fellow cheese lovers are saying, “Take the cholesterol medication Lawson!” And maybe I should . . . But then again, maybe I shouldn’t. Why? Because deep down I believe it’s more important to do what is good for me, even when I don’t feel like doing it. Right actions lead to right outcomes. Even though I need to exercise strictness and denial in pursuit of lower cholesterol levels, the bigger goal is what really counts – being physically healthy. If the bigger goal, spiritually speaking, is growth in faith, then discipline may be what today’s believers need the most but want the least. Let’s be honest. Discipline has probably fallen out of fashion because it runs counter to the whole “it’s a relationship, not a religion” mantra that’s so appealing to those who want their spirituality to be “organic”, “authentic”, and “flowing from the heart”. That’s not to say these things aren’t worthwhile; it’s just that they’re sometimes used to mask our spiritual laziness. Spiritual outcomes require work and discipline. Effort needs to be expended in order for us to mature and flourish. A healthy faith doesn’t just happen. The number one thing we should do to grow spiritually is meet with God every day. There are no shortcuts. Discipline is essential. Spiritual health and growth require a long obedience in the same direction. We must show up daily to read, reflect and act on God’s Word. “That’s easier said than done!”, you say. You’re right. Experience dictates that the discipline of Bible reading and reflection, when undertaken as a solo affair, usually fails. As many of us know from personal experience, even the most disciplined of us don’t get it right all the time. Relying, as we so often do, on our own strength and willpower, we still come up short. So if we can never muster enough discipline in and of ourselves to faithfully and consistently read and reflect on God’s Word, are we doomed to failure? No. We can be successful. But only if we’re prepared to ask for help. Here’s the bottom line: The discipline of Bible reading and reflection thrives when it’s a mutual affair. Specifically, when it’s a partnership with God. A partnership with God . . . Don’t try to go it alone. The discipline of Bible reading and reflection blossoms when you incline your heart to God (cf. Proverbs 2:2), ask Him to fill you with the Holy Spirit (cf. Ephesians 5:18), look to Him to renew your mind (cf. Romans 12:2), and seek, not your own ends, but the kingdom of God and his righteousness (cf. Matthew 6:33). Categories: Relationship, Transformation | Tags: #bgbg2, Bible reading and reflection, Discipline, spiritual growth, spiritual health | Permalink.